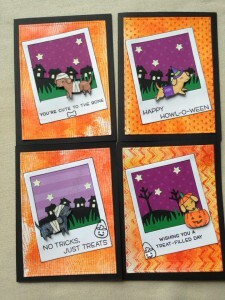 I just bought Lawn Fawn’s Happy Howloween Stamp set and I couldn’t resist dressing those dogs up. I ended up with 16 cards by the time I was done. I used the same basic design for each card, but switched up sentiments, images, background stamps, and background dies to give some interest. 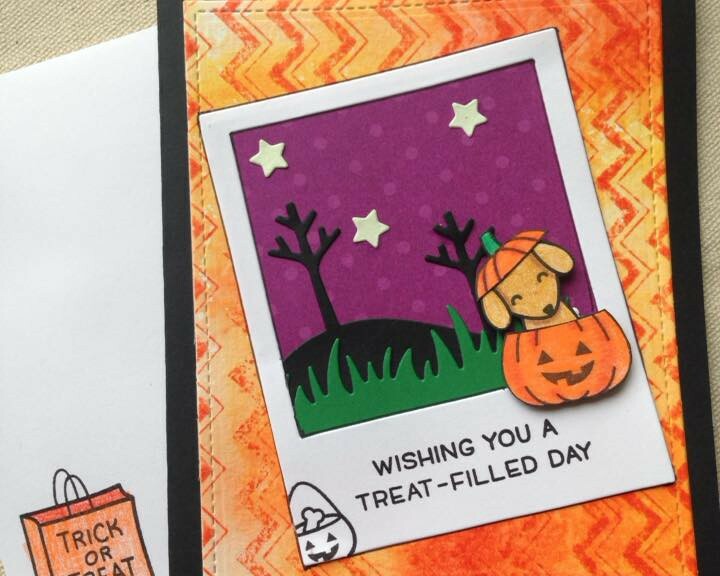 Extra Details: I began these cards by stamping and coloring all of the cute dogs and their costumes. I used Prismacolor Pencils to color everything in. I fussy cut everything out and painted the edges black with a marker. Then I began dressing the dogs. They turned out so cute. I created my orange backgrounds, next. I smooshed some orange Distress Inks on four full sheets of water color paper. I let the ink air dry. 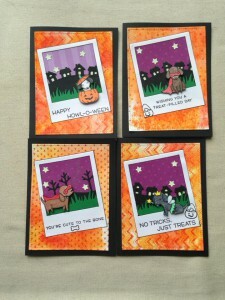 Once dry, I used Ripe Persimmon Distress Ink to add some interest to these back grounds using background stamps. Next, my die cut machine became my best friend. I cut the picture frames, grassy borders, little town borders, and stitched tree borders from a variety of colored card stock. 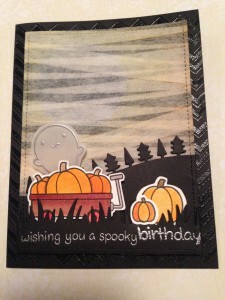 I used a stitched rectangle die to doe cut the ink smooshed backgrounds. 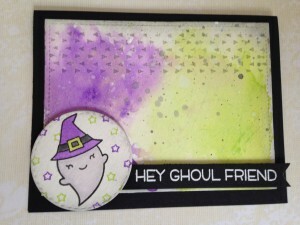 I created a piece of glow in the dark cardstock with some Versa Mark ink and Wow’s Glow in the Dark embossing powder. I die cut the lights behind the windows and doors for the little town die and the stars. Then, I stamped the greetings on the frames. I used four different sentiments for some variety. I began constructing my cards next. I layered the scenes behind the frames. I used a purple pattern paper for the sky. Once the scenes were created, I adhered the frames to the ink smooshed pieces. I adhered the dogs with some foam tape. I created 16 black card bases and white liners. I adhered the ink smooshed pieces flat to the card fronts. 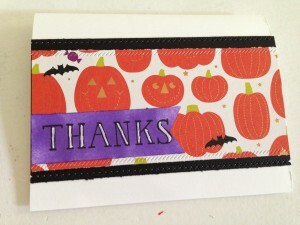 I added a sentiment and some candy corn to the liners. I used colored pencils to add color to the candy corn. 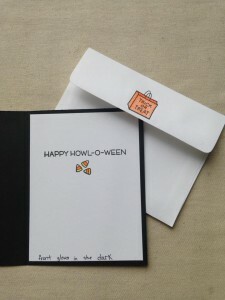 I added a note about glowing in the dark and then adhered the liner to the card. I have donated a few of these to a local basket raffle so I also created matching envelopes. 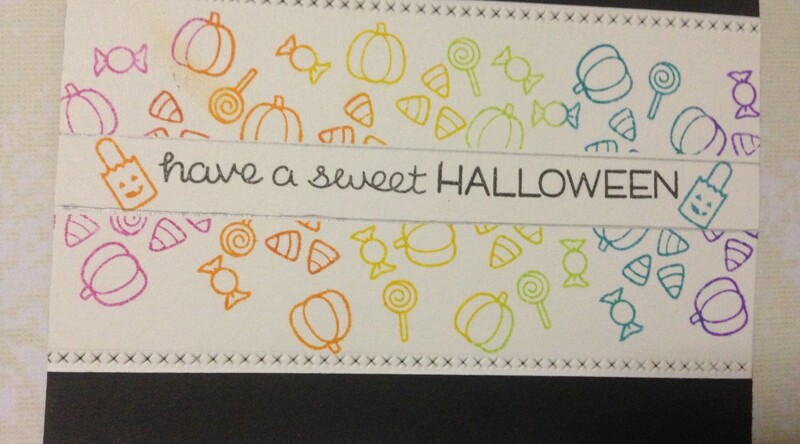 I stamped a trick or treat bag to the back flap and bottom left corner on the front. I used colored pencils to add some color. 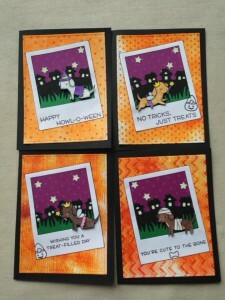 Lawn Fawnatics Challenge 11 – Cards for Kids! These are the thank you cards from my son’s birthday. I needed to make something that fast and easy to make. Extra Details: I started by cutting some strips of patterned paper. 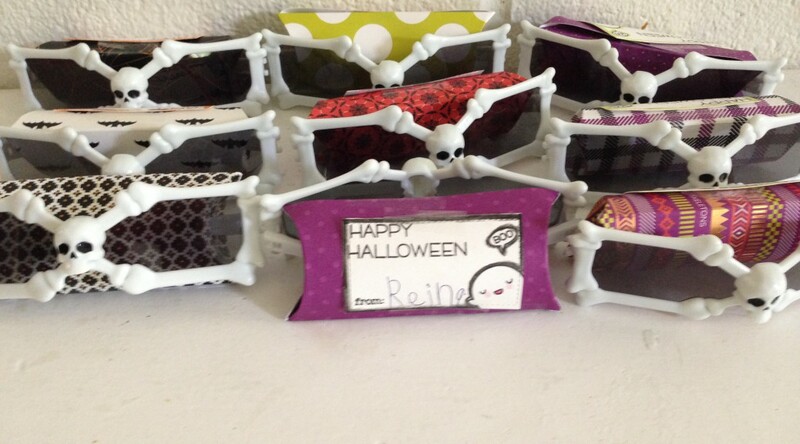 The paper is from a Die Cuts With a View Halloween paper pack. I cut the strips to be 2.5” x 5.5”. I added some stitching detail to the edges with the Lawn Fawn Stitched Borders Dies. I also cut a strip of black card stock for each card. This strip of was 3” x 5.5”. 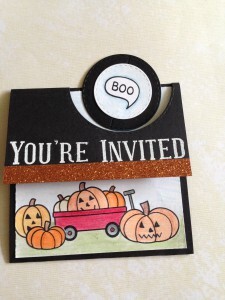 I dry embossed these strips with a dotted embossing folder by Darice. 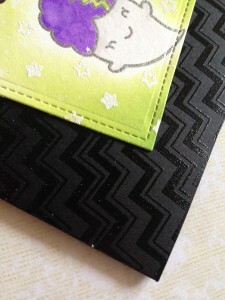 I layered the patterned paper strip on the top of the black strip. Next, I adhered the strips to the white card bases. I made the sentiment strips next. 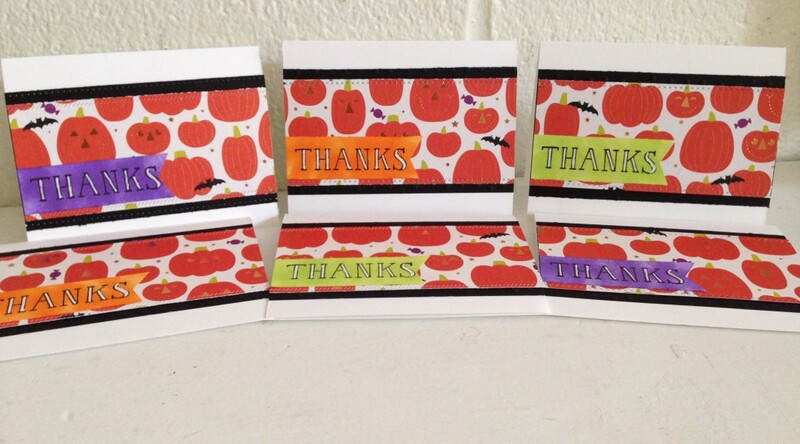 I stamped the Thanks in black ink. I used three colors of Distress Inks to add color to my sentiment banners. I cut in a fish tail end on each banner and attached them to the cards. As a finishing touch I colored parts of the letters in with a white gel pen. 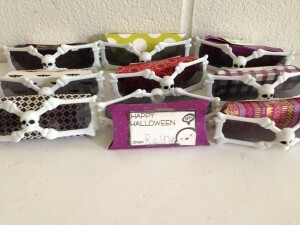 Challenges, fun with paper and ink, Halloween, holiday fun, LOVE! I found a new Flikr Group, LOVE! – Hand made Cards, ATCs, and other crafts. They have a monthly challenge and I thought I would give it a try this month. The theme for this month is Coloring the Season with non-traditional colors. This is the card I came up with. Extra Details: I started by cutting a panel of water color paper to 5.5 x 3”. Using the Lawn Fawn Stitched Borders I added the cross stitch detail to the edge of the panel. I used washi tape to mask off a strip. I used six colors of Distress Inks to create my rainbow. Some of the images inked in one color and then added a second color to help the transitions between colors. 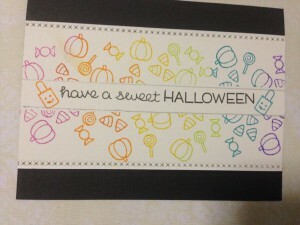 Once I finished the rainbow stamping, I peeled up the washi tape. I added a sentiment in the masked area. I combined two stamp sets to create my sentiment. I also added two more tiny images near my sentiment. I used a silver gel pen to outline my sentiment area. Lastly, I adhered the panel to a black card base and the card was done. My son’s birthday is at the end of this month, which means it is time to party plan! This year, he wants a Halloween party with lots of pumpkins and Jack o’ Lanterns. Here is the invitation that will be mailed out this week. 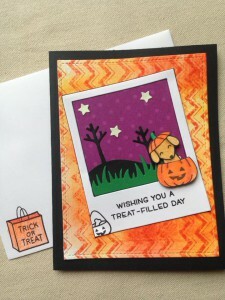 Extra Details: I found a tutorial for this type of card on Christi Beck’s YouTube channel, called Stamp In Texas. Following her directions I created the card base and die cut a circle from the top right section of the card. I also cut a 4” x 4” white panel, a smaller black circle, a small white circle, and a 4” x 6” white panel. 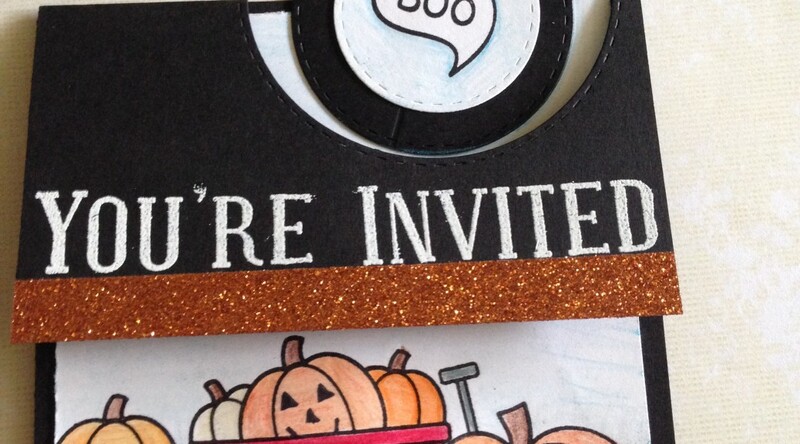 I heat embossed “You’re Invited” with white embossing powder on the top flap. 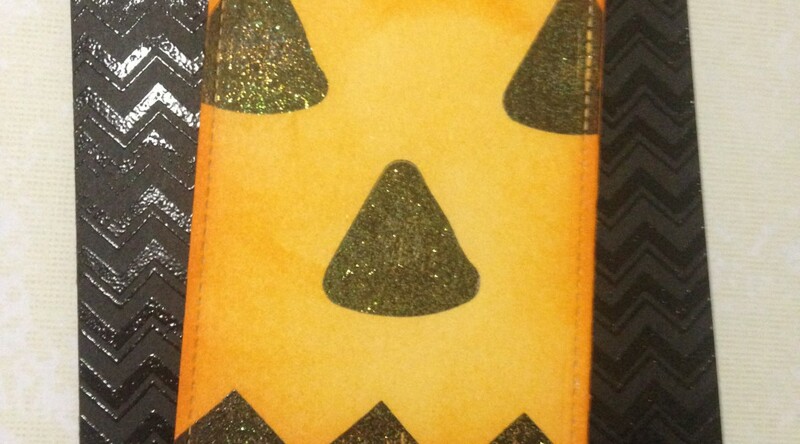 I added some orange glitter tape under the embossing and folded the extra over the edge. 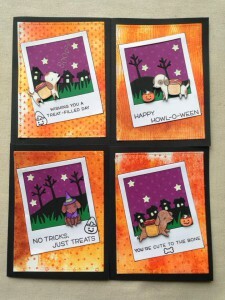 Using masking, I created a lineup of pumpkins on the bottom of the square white panel. I added some Jack o’ Lantern faces with a thin black Sharpie. 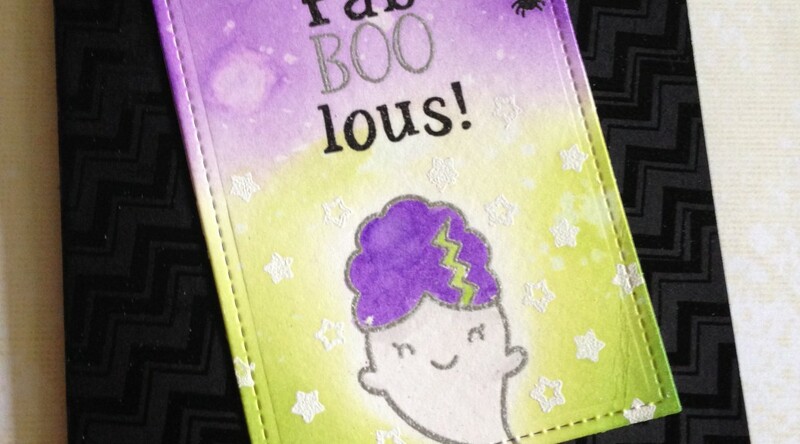 I stamped the ghost so he could hide under the top flap. I used colored pencils to add color to the scene. Then, I adhered the scene panel to the card base. 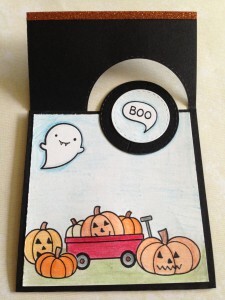 I layered the white circle on the black circle and stamped the Boo speech bubble. I added some colored pencil to the white circle as well. Then I adhered the circle to the scene panel where it pops out through circle die cut. I added the party information and some stamping to the 4”x 6” panel and adhered it to the inside of the card. 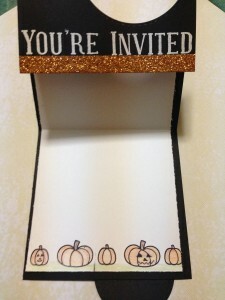 I love the way this invitation turned out. Halloween is coming and I’m getting in the spirit. I made this card for a friend who just started a new job. 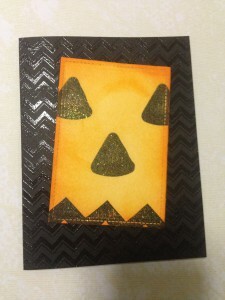 The current Simon Says Stamp Monday Challenge inspired me to use a lot of embossing powders. 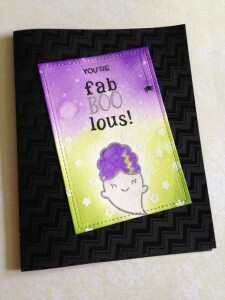 Extra Details: I started by clear embossing the chevron strips on a black card base. I still struggle with lining up background stamps and getting a perfect impression every time. 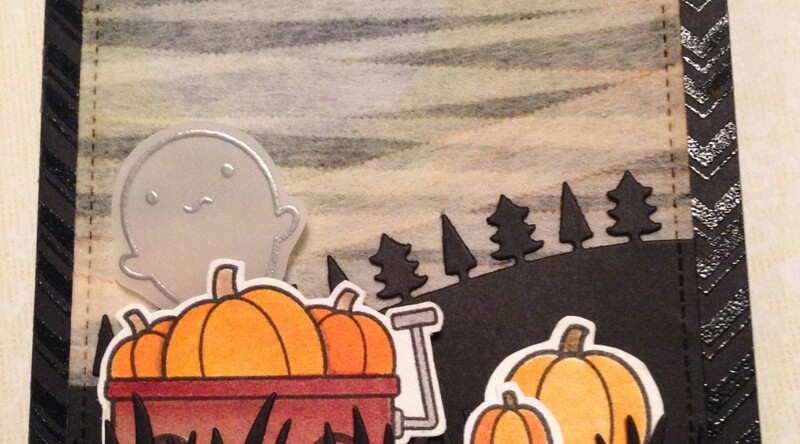 I still love the way the background turned out, it feels very Halloween-ie to me. Next, I die cut a smallish stitched rectangle from water color paper. I created my own custom sentiment. I saw this sentiment on a Halloween decoration at a local store and fell in love with it. 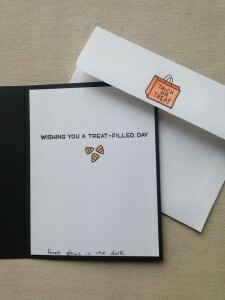 I used black ink and clear embossing power on the black parts of the sentiment and the little spider. 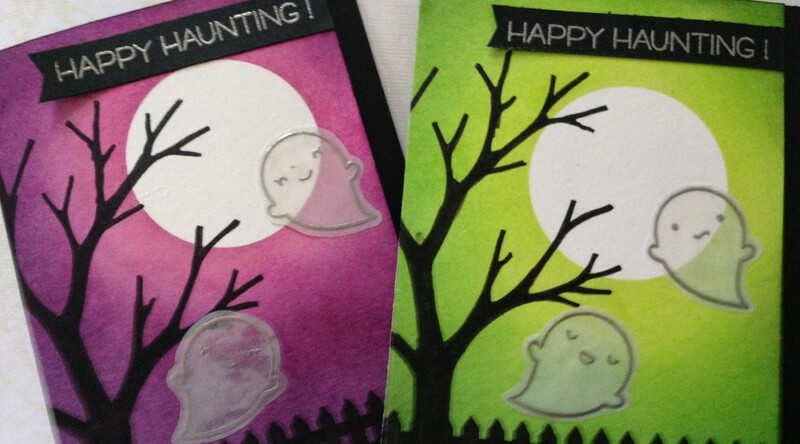 For the ghost and Boo, I used silver embossing powder. 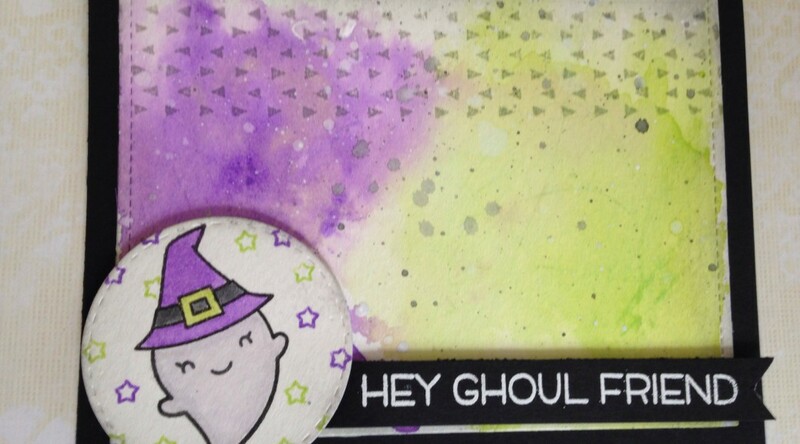 I felt that my ghost was a little lonely on the bottom of the panel, so I added some stars with white embossing powder. Once all the embossing was dry, I added color to the panel. I used Distress Inks for everything. I carefully ink blended some purple and green inks on the background using a foam tool. I water colored the ghost with the same ink. I added some very light grey ink to the ghost for shadows. For added texture, I flicked some water on the panel and soaked it up a clean paper towel. I added my panel to my black card base and was done. I have been seeing so many beautiful inked backgrounds on the Lawn Fawn Flickr group lately. I love looking at them and wanted to try one also. However, I couldn’t decide which color combo I wanted to use, so I made two cards. Extra Details: I started with a panel of water color paper. The first thing I did was die cut a circle to use as a mask. Using a repositionable adhesive, I placed it on the water color paper. Then I began ink blending. I used three shades of Distress Ink and Black Soot for each panel. I started with the lightest color closest to the circle mask. Once I was done ink blending, I removed the mask and set the panels aside to dry. I found a scrap of vellum and stamped my ghosts on it. I used Versa Mark ink and silver embossing powder. 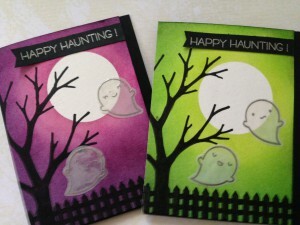 I fussy cut the ghosts out once the embossing powder was cool. I stamped the tree and fence in Versa Fine ink and filled the images in with a black Sharpie marker. Next, I trimmed the panels down a little and adhered them to the black card bases. Then, I adhered the vellum ghosts. I used a liquid glue that I tried to keep under the embossing lines. Sometimes, it work very well and sometimes, it did not. Lastly, I heat embossing the sentiment on a scrap of black card stock with silver embossing powder. I trimmed the sentiments into little banners and attached them to the top of the inked panels.